Gifted children come with a certain set of needs. The same is true for students with learning challenges or disabilities. But what about kids who fall into both groups? These children are known as twice-exceptional. 2e kids display amazing gifts, talents, or potential in some areas while also being challenged in other areas with learning differences, such as ADD/ADHD, Asperger’s or autism spectrum disorder, sensory issues, and more. Why is focus in this area important? 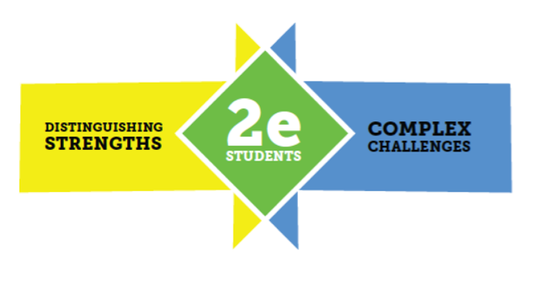 Increasing numbers of 2e students are being reported. According to the Oak Foundation, approximately 20 percent of children (10 million students) in United States public schools have learning profiles that are not aligned with the expectations and teaching methodologies prevalent in mainstream school systems. Yet, there is limited educational literature providing comprehensive theory and strategies for meeting their academic and social emotional needs, and misdiagnoses, missed diagnoses, and misunderstood behaviors are common problems. What we do know is that this population of students is that their dual diagnosis results in a paradoxical set of needs. Such youngsters require both remediation and enrichment, as well as special counseling to help them grasp the mix of conditions with which they must learn to succeed. And even more important is to really understand the duality of their needs and how that makes this population of students unique and leads us to question the appropriateness of using traditional talent development and remedial approaches with 2e students. The color green is a combination of yellow and blue. 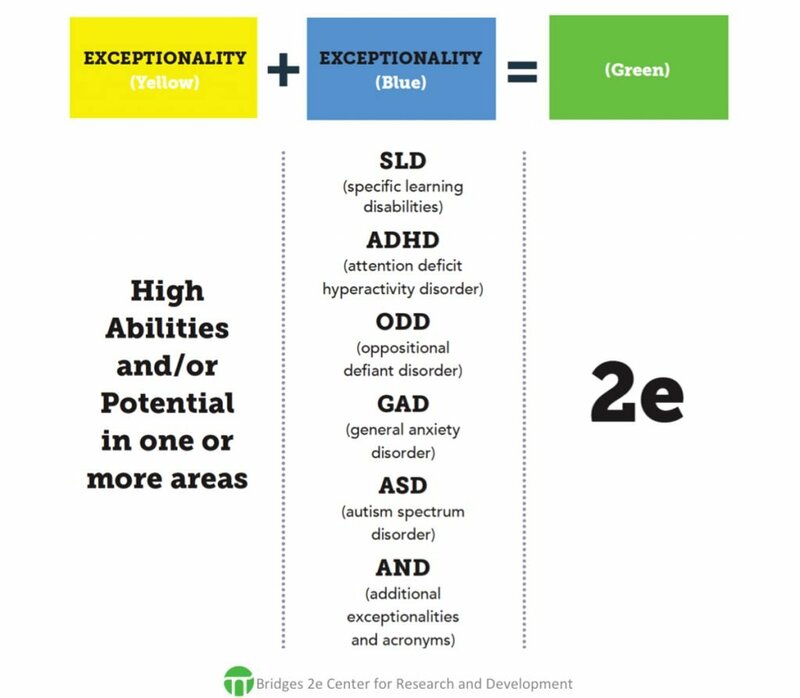 In the adjacent graphics, yellow is used to represent traits indicative of giftedness and blue is used to represent the learning, attentional, and behavioral challenges or the “other e.” This clearly shows the 2e students are not separable into only their “yellows” or their “blues.” These individuals are shades of green. In order for 2e students to thrive parents, teachers, administrators, and therapists need to understand these students in order to provide appropriate programs for them. •PARENTS face the challenge of finding professionals who understand how to identify twice-exceptionality and understand the issues faced with dual diagnosis. They need to remember that “treatment is not only fixing what is wrong but nurturing what is best.” (Seligman & Csikszentmihalyi, 2000). They need to advocate for their children to assure that appropriate programming is in place that includes both intellectual stimulation in strength areas and support in areas of academic or behavioral challenge in ways that are respectful and acknowledge the strengths of their youngsters. •CLASSROOM EDUCATORS AND SCHOOL ADMINISTRATORS face the challenge of understanding the complex profile of these students and their need to be learning within a strength-based talent-focused curriculum. Baum, Schader & Hebert define this approach as using knowledge of students’ strengths, cognitive profiles, learning preferences, interests, and talents to engage them in the curriculum. The strengths and interests can be leveraged for skill development — including academic skills, self-regulation skills, executive function and emotional regulation. •THERAPISTS face the challenge of understanding how the discrepancies between what 2e students can do and what they can’t do causes these youngsters great anxiety and play havoc with their self-esteem, and may result in low self-efficacy. Therapists must understand the strengths and abilities that are associated with a particular diagnosis and use that understanding in providing support for these students. For instance, because dyslexic students may not read well but may be outstanding Lego builders, therapists need to know how to use that information to help students grow academically, emotionally, and socially. •SPECIAL EDUCATION PROFESSIONALS AND TUTORS face the challenge knowing when to question the efficacy of using traditional kinds of remedial techniques that are typically used for skill development. For instance, using materials that match their skill level might be demeaning to a gifted youngster with decoding difficulties. They need to find ways to engage students intellectually while attending to the level-specific skills. In addition, these professionals must use strategies that authentically weave students’ strengths, interests, and talents into their teaching. 2eNews.com and Variations2e magazine are focused on providing the latest news, research, and perspectives around how to best support the needs of this population of learners. We provide readers with high-level information and perspectives about twice-exceptional education, covering a broad range of topics that are essential for all educators, parents, and industry professionals. Our content is presented in the following categories: Teaching & Learning, Health & Wellness, Child Development, Home & Family, Advocacy & Policy, Voices, Resources, and Book Reviews. 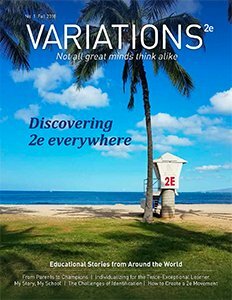 We also house the entire catalog of 2e: Twice-Exceptional Newsletter, and we publish the Variations2e print magazine twice per year. Our mission is to maintain a fruitful conversation among key stakeholders to improve the lives of gifted students with learning differences. Many resources on our site are public, though the majority of our original content is available via a subscription to 2eNews.com. You may purchase a subscription or sign up for a free three-day trial here. View definitions, resources, and more primers on twice-exceptionality here.